For the month of November, I have $138.43 left in the grocery budget. Country Farms produce stand -- the last day. 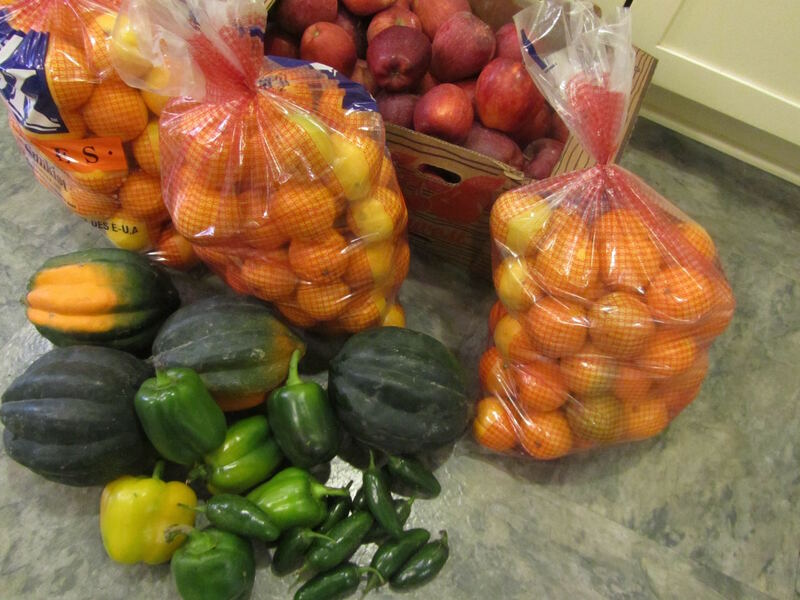 I bought 30 lbs of small oranges for 49 cents/lb, 24 lb box of new- crop Red Delicious apples for $8.95 (about 37 cents per pound), 4 acorn squash (from 2.25 lbs to 2.5 lbs each), priced at 50 cents each (about 22 cents/lb), 6 yellow and green peppers (2 for 49cents) and 11 jalapeno peppers (for making salsa for 77 cents total. I spent $28.16. Nov 6. Dollar Tree for my monthly run. I buy 2 quarts of almond milk, and spend $2. Nov. 12. I stopped in at the local garden center to buy daffodil bulbs. They sell pumpkins in fall, but then turn their business over to Christmas in early November. They put their remaining pumpkins out for free sometime in November, every year. I happened by there on one of those days, and picked up 4 nice large pumpkins, and several small sugar pie ones. Don't worry, I left plenty behind! Nov. 16 Fred Meyer. As mentioned on my facebook page, I went to Fred Meyer to get a turkey. The deal is spend $50, buy a turkey for 69 cents per pound. Fortunately, FM is a discount store, as well as a grocery store. So I was able to spend the $50 without paying inflated prices on anything. In food, I bought one almost-20 lb turkey and 4 half-gallons of milk (99 cents each with coupon) and 4 half-gallons of orange juice (99 cents with coupon). After running everything in the calculator that I carry in my purse, I was 1 cent short of the $50, so I picked up 1 Lindt truffle, on sale for 25 cents, getting me over that hump of a minimum spend in order to make the turkey deal. Spent $19.93 on food, including the turkey. Nov. 18 Trader Joe's for cocoa powder, $2.49/9-oz canister, best price on cocoa powder in our area. I want 2 canisters for birthday cakes and holiday baking. I spent $4.98. Cocoa powder is much less expensive than baking chocolate or chocolate chips. And you can make some very nice desserts with it, such as Buche de Noel, or a cocoa glaze for homemade eclairs. I also like to bake pinwheel cookies, swirls of chocolate (cocoa powder) and vanilla dough in a refrigerator cookie. They look "fancy", but are very affordable to make. Nov. 19 Fred Meyer for that other turkey. I bought very little "food", just 3 half-gallons of orange juice (99cents each with coupon). All of this orange juice -- I freeze it, after pouring out 1 glass. These 3 half-gallons were enough to satisfy the minimum, with the other purchases. Plus the turkey brings me up to $16.47 today. Nov. 28 At Fred Meyer, picking up gift cards to use for Christmas shopping (4 X fuel rewards on gift cards this week). Also checked the egg cooler. Found 1 dozen repackaged eggs (I posted on these in June) for $1.19. I knew I'd be needing another dozen eggs, at least, in addition to the eggs I have frozen, to get me until Easter. I was very glad to find the repackaged eggs! Now I'm done shopping for the month. For November, I spent $232.21, $93.78 over. But, we are pretty well-stocked right now. There's not a lot that I need, now. If I had to, I could get by with only buying milk, and still do fine for quite a while. That's a pretty good feeling, and totally eases the pain of going over budget for so long. In December, I'll buy a ham or two, maybe some cream cheese, and perhaps some other holiday foods, but not sure, yet. I never did buy canned pumpkin. I bought some fresh pumpkins in October, and then got several more pumpkins for free, this month. I've been cooking and freezing the puree. I should have enough pumpkin to get through the year. You had a great month for grocery shopping. Your milk prices always amaze me. I love how beautiful your farm stand produce looks. It is a good feeling to be stocked for the holidays. Thank you for sharing your deals. I always love seeing what you got. Thank you! I feel we are well-stocked now. I hope you are, too! You know, though, just when I think I found a rock bottom price, I find even better deals on both the ground beef and the pecans this week. Argh! Oh well. Now I'll decide if I want any more or to just leave it all as is. You are a great shopper, Lili. I really need to check out Cash & Carry, as we have one not too far out of the way. Cash & Carry has their specials online, if you want to see what's on sale from week to week. And you can check their regular prices, online as well, by doing a product search. D'oh! I realized that I told you the wrong price on cheese--I got it for $1.49/8 oz, not 16 oz. Brain freeze! Good job on your frugal shopping. Okay, so now my cheese-envy is waning! But for sharp cheddar, that's still a great price. You find such awesome deals! Since we're out of town, i've spent little on Thanksgiving. But, i've spent too much eating out and buying supplies for the down times. Thankfully, all was planned for. It's (almost) painful to spend money on food when my cupboards at home are full! That's the way to do a vacation -- to plan for it in advance as you have. Good job! But I understand what you mean. I've been in a different city and needed to buy sandwich ingredients and had a hard time spending $3 or $4 on a loaf of bread, when I can make it at home for 50 cents or so. I hope you are really enjoying your time away! I like your monthly summary list of different categories. Not that I need to know, but it helps me put what you buy into better perspective. Sounds like your ready for the holidays and winter. I hope you and your family had a lovely Thanksgiving! What great prices you have found in November, Lili. The acorn squash for 50 cents, gallons of milk for 89 cents, and free pumpkins were all great finds. I agree with you about the pecans being being pricey. The local bank is selling them in one pound bags for $9.00, which is about the price of them at the store. I do not have any plans to buy any this year. I need to spend that money somewhere else. I also agree with you about the cocoa powder. I make brownies, fudge, and chocolate sauce using cocoa powder because it is so much more affordable than chocolate. It's good that you've thought through whether to buy pecans or not this year. Some years we do buy some, but other years there just isn't enough wiggle room in the grocery budget to justify something so pricey. Some years, walnuts are a good alternative to pecans, in both texture and taste. I'm allergic to walnuts, so I've always had to go with pecans or almonds, for baking. I don't think I'll ever see 89 cents a gallon of milk again! One of my daughters was asking when I last paid 89 cents a gallon for milk, and I had to say never, as an adult. Back in the late 80s when I was first married, milk was 99 cents/gallon. And that was the beginning of buying milk for me. My daughter is allergic to so many things, some fruits, some vegetables, and now she is starting to have nut allergies with almonds. I'm sorry that you have a nut allergy with walnuts. It can be frustrating. Oh no! Almonds are becoming common ingredients in many baked goods and candies. I'm sorry to hear that Bailey has so many allergies. It does make learning to cook from scratch really helpful. I always enjoy your grocery spending journal posts. It's nice to see what people in other areas are spending for certain items. You always get a lot for your money. I really try & do that too, some months are better than others. I have spent a lot on groceries the past couple of weeks but feel that I got some great deals & did a lot of stocking up. My problem is that I have a hard time not to buy at great prices even when we are really stocked up! I have the same issue, wanting to continue to stock up, even though our pantry is full. Generally, if I have storage room, then I'll buy more. This past week, ground beef has been on sale at a very good price, but my freezers are full, so I had to choose not to buy any. I do tell myself that there will be more sales in the future, and that helps. I envy you. Do you realize how lucky you are to have all those stores to choose from. I live in a tiny city of less than 2000 people with only one grocery store and as you can imagine prices there are high...very high. Our closest larger city is 100 miles away round trip and even then we have none of the discount grocery stores. We have a short growing season so there are no farmer market from October to May. I'm not complaining because I choose to live here and the benefits outweighs the disadvantages. I love reading your grocery journals even if I have no hope of ever being able to find such good prices. I do buy what are bargains for me and my cupboards and freezers are full. And that's a good feeling. I'm on a limited budget since I'm retired and when the money runs out for groceries I am done purchasing for the month, regardless of how good the deals are. Thank you for showing us how we can enjoy our lives even if we have to cut back. I do realize how fortunate I am to live in a place with many shopping options. I can imagine what shopping in your small town must be like. I must say, kudos to you for really living on your income. So many folks, although on a limited budget, will just dig themselves into debt, continuing to spend long past the limits of their income. Good job, Susan! You're doing great!